Paul E. Zimmerman.com: Negative Correlation Between Bitcoin and Gold Gaining More Notice, Maybe Generational? 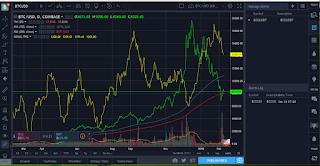 Negative Correlation Between Bitcoin and Gold Gaining More Notice, Maybe Generational? 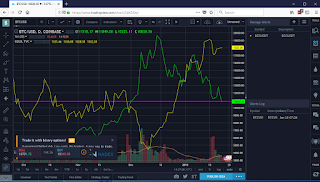 I came across an article the other day that follows on a post that I wrote several weeks ago about the appearance of a negative correlation between the price of Bitcoin and gold, coinciding with a typical uptick in the gold market ahead of the Chinese Lunar New Year. 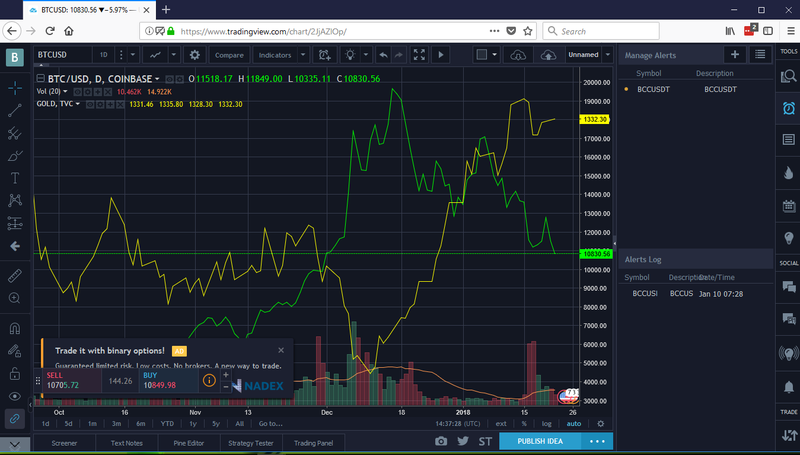 As I wrote then, from a bottom for gold (the yellow line) around December 11th, and a peak for Bitcoin (the green line) around December 16th, the two rapidly began to trade places in terms of their price movements, crossing over on January 8th of this year. Since then, Bitcoin continued down and gold continued up. But then on January 25th, gold's move higher abruptly halted and began to reverse. Bitcoin continued its slide, but then on February 6th, a day of high volume that coincided with a hammer candlestick, the price action appears to have reversed (and that has been great for my Hashflare mining account, which thanks to the price reversal allowed for another automatic reinvestment that has pushed my account to the 1 terahash of mining power mark). While the price movements of the two commodities do not move in perfect sync with each other (almost nothing out there that demonstrates any degree of correlation ever does), the negative correlation does look to be continuing. After gold began to slide, Bitcoin apparently found the bottom of its slide and began to reverse. This suggests that, at least in part, cash flowing out of gold is finding its way into Bitcoin. 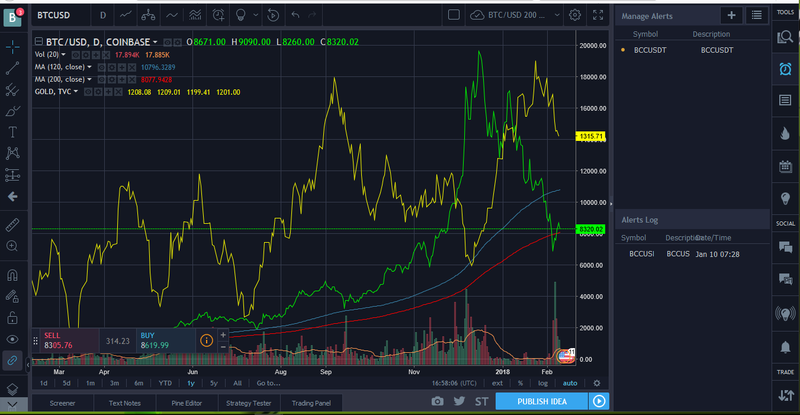 Going forward then the question will be, will this become a stronger negative correlation, or is this the beginning of a shift some have speculated might occur one day, that people will abandon the use of gold as a long term store of value in favor of Bitcoin? There's a small amount of evidence out there that this is exactly what some are doing. That is where some of the wild sounding forecasts of Bitcoin's future price come from: if Bitcoin comes to be viewed as "digital gold," and this draws capital out of gold and into Bitcoin, then based on the respective market caps of the two commodities, a shift of value from gold to Bitcoin could increase Bitcoin's value by thirty to forty times. Gold has been a traditional store of value for thousands of years because of key physical properties it possesses, namely its durability and scarcity, but also because a fitting alternative did not exist across all of the technological changes during those millennia leading up until now. But now we are in the early years of a new era, a digital one, and the way we do business has changed dramatically, whereas gold has not. Then along comes distributed ledger technology and Bitcoin, with engineered scarcity and durability (more so than gold, practically), and we potentially have the new "perfect" tool to fill that role in this new age. A major, global shift of preference from gold to Bitcoin may be inevitable; after all, you cannot send gold in an email, but you can transmit value in essentially that way via a cryptocurrency. If that will happen basically depends on a cultural shift and how people perceive the value of things, and as the article I linked to above briefly mentions, the dividing line of that shift is probably going to be generational. Millennials, a generation that is now numerically greater than the Baby Boom generation, who have largely grown up with the Internet as a part of their lives from the beginning (as has "Generation Z," coming right behind them), and who have endured several global economic shocks as they entered their working years are by many measures holding "the way things have always been done" in low esteem. That being the case, "stocks, bonds, and gold are how saving and investing is how things have been done for generations" is a proposition that is likely to fall on deaf ears. Add in that access to a traditional store of value like gold is much harder than that of Bitcoin, that the retirement wave the Baby Boom generation is now in poses price risks for gold, stocks, bonds, etc. as that generation begins to liquidate to raise cash for their retirement (possibly in a huge crash if they all "rush for the exits" together), and Bitcoin gains further appeal over simply following tradition. Thus, for younger generations faced by these "demographics are destiny" possibilities, Bitcoin may represent the perceived best option as a shelter to go into until the "global greying" passes and it's safe again to wade out into those other markets, when prices have returned to what you might call "population-adjusted" levels after the older generations die off. Perhaps a long-term decline in the price of gold will be the canary in this particular coal mine.